Mule Day commemorates the first mules making it to the US from Spain. Mules are bread from a male donkey and a female horse. 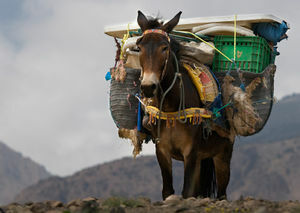 Since horses and donkeys are two distinct species, the resulting mules are usually sterile. Mules, however, seem to take on some of the best characteristics of each of their parent species. They are said to be stronger, smarter and have better endurance. They are valued work animals and have even been used by the U.S. Military. Perhaps, the saying should be changed from Stubborn as a Mule to Useful as a Mule. This page was last modified on 13 September 2013, at 08:28.